When thinking of rhythm games, most gamers see images of fake plastic instruments and greedy publishers. Guitar Hero and Rock Band peripherals are the radioactive waste of gaming, populating every yard sale, thrift shop, and dumpster nationwide. We tend to attribute the falling gem style of gameplay to GH, but the truth is there existed a series with this style of play long before we got to pretend to be rockstars. Beatmania is the star of Japanese rhythm games and came to the scene in 1997 courtesy of Konami, roughly eight years before Guitar Hero's debut. 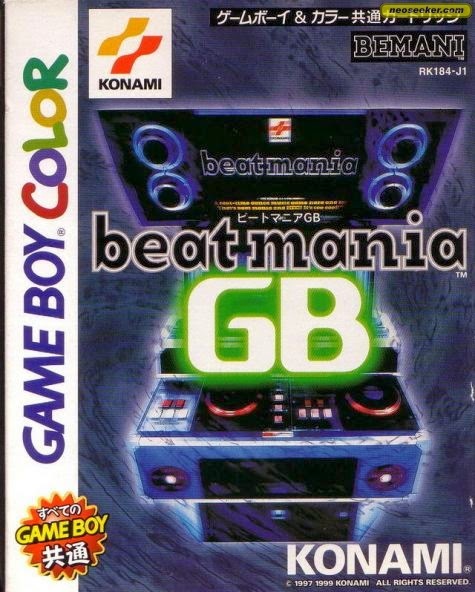 Beatmania started in the arcades and has since seen ports to home consoles, including the Game Boy Color. Searching "Beatmania" on Youtube will bring up videos of arcade-goers hammering away at a control pad with almost inhuman speed. These versions of the game are considerably more intense than the original as they feature much more quickly scrolling gems and two additional buttons, but this handheld port of the original arcade version, like any rhythm game worth its salt, will wear your fingers down to bloody stumps by the end of it. Beatmania GB condenses the arcade panel from five buttons and a turntable to the Game Boy's layout perfectly. Left, Right, and Up on the D-Pad along with the A and B buttons represent the five main keys while Start takes the place of the turntable. Anyone who's played a rhythm game will be able to clear the first few songs on Normal mode without much trouble, but may have to retry the last one a few times. Those not familiar with the genre or don't care for the layout can tailor the game by adjusting the difficulty or reducing the number of buttons from five to two or three as well as rearrange their configuration in relation to the columns of notes. A music game on the Game Boy may sound odd to some given its relatively primitive capabilities, but there's a reason the hardware has taken on a new life as a digital musical instrument. Its distinct sound represents a time when games were transitioning from primitive worlds with barely distinguishable blips and bleeps and crude visuals to more fully-fleshed entertainment experiences with lively soundtracks them all the more engrossing. The melodies within Pokemon Red/Blue and Tetris are some of the most iconic tunes in gaming, period. Beatmania GB beautifully represents this hardware with over a dozen tracks spanning classical, jazz, reggae, j-pop, techno, and more. You may have listened to Mozart hundreds of times before, but you haven't really heard it until it's been synthesized on a Game Boy and pumped out through a grainy, coin-sized speaker. 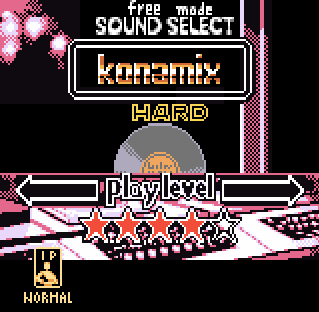 There can't be more than thirty minutes of audio among all of the game's tracks but as it is with any rhythm game, Beatmania GB is endlessly replayable. Until every song can be completed perfectly with not a single note receiving anything less than a "Great", there is still work to be done. Even after this mastery is accomplished, it's no less enjoyable to replay your favorite songs. If that isn't enough, there is also support for two players via link cable as well as a challenge mode where notes disappear before shortly before reaching the bar. Tapping away on the tiny buttons of a Game Boy in time to a tune is oddly satisfying. The game dishes out notes in surprisingly tricky sequences at times and doesn't fail to make the player feel like they're playing the song despite the fact that only two thumbs are being engaged. 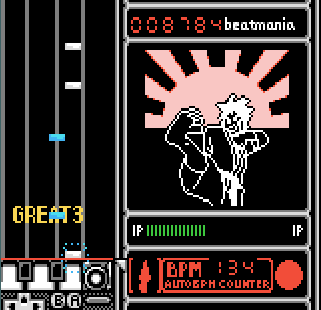 Beatmania GB, as well as games like Elite Beat Agents and Rhythm Heaven prove that we don't need elaborate controllers modeled after real instruments to enjoy a rhythm game as they are all equally effective at satisfying our deeply rooted rhythm centers.